In this blog, we will see 25 different insight of " The Lord is my Shepherd" I hope you will be blessed after reading this. 1. If the Lord is my Shepherd, then why should I worry. 9. Whenever any enemy try to attack me, he is always there to protect me. 10. He looks into my eyes, he keep his hand over my head and he makes may body warm by rubbing his palm over my body. 12. 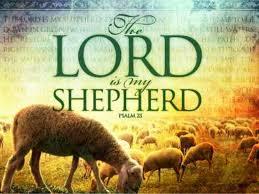 The word of God doesn’t say that Lord is the Shepherd of all our ours it says he is MY shepherd. 13. Because he is my Shepherd his full attention, thoughts and focus is towards me. 14. He trust me because he loves me. 15. He has chosen me. 16. He comes to know whenever I am hungry and then he feeds me with Green Grass. 17. He cares for me. 18. When I thirst he take me to a still water and he quenched my thirst . 19. Being a sheep my language is different and my Shepherd language is different, but still He understands my language and I understand his language. Because we have a heart to heart relationship and we speak through heart. 20. When many sheep’s are crying or calling to Him ,among them also He recognize my voice because he is My shepherd and he respond to me quickly and I hear his voice too. 21. Jesus is my shepherd. 22. As God has given his only begotten son for mankind same way Jesus has chosen me as his Sheep. 23. Jesus never get bored of me and when I am bored he knows how to turn my mood and make me feel good and he restores my soul. Because he is my Shepherd. 24. Wow I am so grateful that no one else but Almighty God is my Shepherd. 25. I feel so secure because I know My Lord is my Shepherd. In the next blog, I am writing about Psalm 91:1 so do check out that page. John 10:10 says I am come that they might have life and that they might have it more abundantly.